Why is there no stress on the top or bottom of a temperature-loaded rod (heating on top) when the rod is not embedded? Or why does an upwardly curved rod (due to heating on top) have a tension on the underside when the rod is embedded. This would then have to be a compressive stress on the bottom, right? The topic can be illustrated relatively simply on a single-frame carrier. For this purpose, 3 systems are described below. The three systems mentioned are documented in the attached file. The rod curves upwards, but is tension-free ansich. Like system 1, but with an additional barbed. The rod bedding is hereby entered without possible failure (nonlinearity). If one can visualize the stresses sigma_x of the rod for the system 2a, pressure is obtained on the upper side of the bar and tension on the lower side of the bar. See picture 1. Due to the curvature of the rod and the existing Stabbettung a contact force pz is caused, which is to hinder the curvature of the rod upwards. See picture 2. 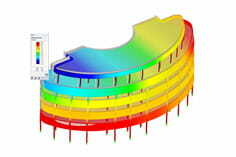 These contact forces pz (Figure 2) are caused by the curvature of the rod due to the temperature and the applied rod bedding. The illustrated contact forces can be replaced by a curvature opposite rod load. See system 2b in the example file. The bar bedding is removed here and the variable bar load is entered in the Z direction. Are the results (eg. B. the deformations uz) compared to the two systems 2a and 2b, one obtains equivalent results. See picture 3. In addition, the voltages sigma_x can also be represented for the two systems 2a and 2b. These are also equivalent. See picture 4. System 3 was introduced only to document the stresses due to temperature difference on a statically determined system (without bedding). 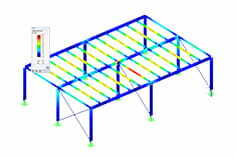 The results documented in the example "single-field beam" can be analogously applied to elastically bedded surfaces.